NETWORK UPDATE: HAWAII 5-0 gained 0.1 in final Friday numbers. In addition, note that Nielsen has issued highly suspicious numbers showing SHARK TANK as having doubled its preliminary Friday rating to 3.6, and 20/20 almost doing the same by rising to 2.3. We’ll update this post when new info comes in, but for now take those numbers with a large amount of salt. Discovery was well in front of anyone else on Friday cable, with GOLD RUSH up a tick to 1.47 and ALASKAN BUSH PEOPLE up 0.03 to 1.25; just a bit farther down was GOLD RUSH: THE DIRT, down a tenth to 0.55. ESPN’s coverage of the NBA ALL-STAR weekend events was at 0.83. Disney’s BAD HAIR DAY was at 0.78. On Adult Swim, NEWSREADERS gained an impressive 0.19 to 0.77, a 4AM episode of FISHCENTER (really) was at 0.53, and DINNER WITH BRETT GELMAN was at 0.52. On Lifetime, BRING IT lost 0.22 to 0.44, and PREACHER’S DAUGHTER was down 0.09 to 0.34. REAL TIME WITH BILL MAHER (HBO) edged up 0.02 to 0.31. BANSHEE (Cinemax) ticked up to 0.24. On Syfy, 12 MONKEYS stayed at 0.23, and HELIX was down 0.01 to 0.13. 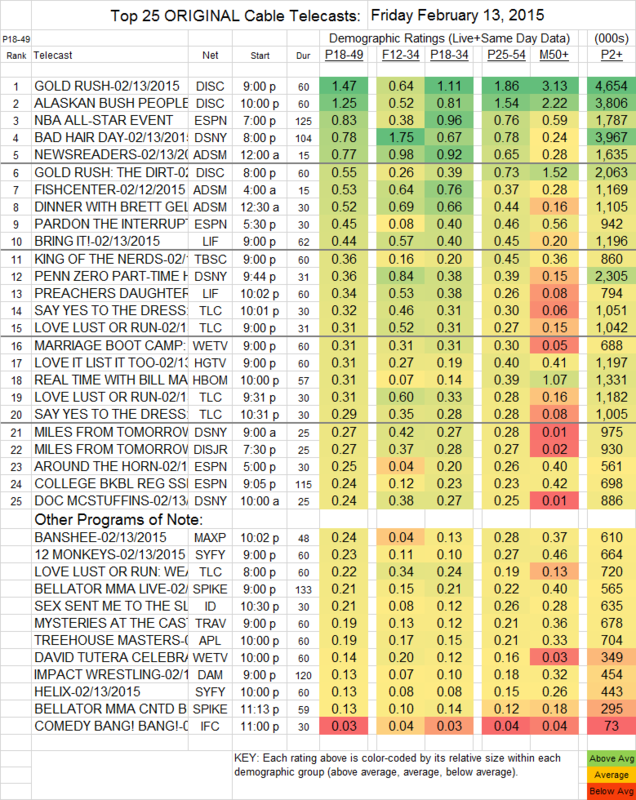 COMEDY BANG BANG (IFC) remained at 0.03. Here’s the weekly download of IMPACT WRESTLING data: in 18-49s, the 9PM airing was down 0.04 to 0.13, and in total viewers, the show fell by about 70K to 454K, with households at 0.29/336K. The rebroadcast added 0.09/110K households, 0.04 in 18-49s and 142K total viewers.